Feathered dinosaurs were covered in ticks just like modern animals, fossil evidence shows. 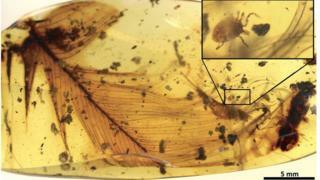 Parasites similar to modern ticks have been found inside pieces of amber from Myanmar dating back 99 million years. One is entangled with a dinosaur feather, another is swollen with blood, and two were in a dinosaur nest. ''Ticks parasitised feathered dinosaurs; now we have direct evidence of it,'' co-researcher Dr Ricardo Pérez-de la Fuente of the Oxford University Museum of Natural History told BBC News. Amber is fossilised tree resin. The sticky substance can trap skin, scales, fur, feathers or even whole creatures, such as ticks. In this case, the researchers found a type of tick, now extinct, that is new to science. They named it, Deinocroton draculi or "Dracula's terrible tick". "Ticks are infamous blood-sucking, parasitic organisms, having a tremendous impact on the health of humans, livestock, pets, and even wildlife, but until now clear evidence of their role in deep time has been lacking," said Enrique Peñalver from the Spanish Geological Survey (IGME), the lead researcher on the study. The fossils in amber may echo the fictional world of Jurassic Park, but they will not give up the secrets of dinosaur DNA. All attempts to extract DNA from amber specimens have failed since the complex molecule is too fragile to be preserved. However, the fossils do give a snapshot of the lives of the feathered dinosaurs, some of which evolved into modern-day birds. "The fossil record tells us that feathers like the one we have studied were already present on a wide range of theropod dinosaurs, a group which included ground-running forms without flying ability, as well as bird-like dinosaurs capable of powered flight," said Dr Pérez-de la Fuente. "So although we can't be sure what kind of dinosaur the tick was feeding on, the mid-Cretaceous age of the Burmese amber confirms that the feather certainly did not belong to a modern bird, as these appeared much later in theropod evolution according to current fossil and molecular evidence." The researchers found further evidence of ticks riling dinosaurs. Hair-like structures from skin beetles found attached to two of the ticks suggest they lived in the nests of feathered dinosaurs, along with the beetles. "The simultaneous entrapment of two external parasites - the ticks - is extraordinary, and can be best explained if they had a nest-inhabiting ecology as some modern ticks do, living in the host's nest or in their own nest nearby," said Dr David Grimaldi of the American Museum of Natural History, who worked on the study. Together, these findings suggest that ticks have been sucking the blood of dinosaurs for almost 100 million years. After dinosaurs died out in the mass extinction 66 million years ago, ticks clung on and continued to thrive. Ticks are closely related to spiders, scorpions and mites. They feed on animals and can pass diseases on to people, pets, wildlife and livestock.